In this article, you'll learn how to access all the features the Vim plugin has to offer. The only prerequisites are that you have Kite Engine running and the Vim plugin installed. If you don't have the Vim plugin installed, you can learn how to do so here. Note: If you installed the Vim plugin while Vim was running, you'll need to restart Vim for the plugin to activate. If Kite is installed properly, you should see a Kite status message. Kite: Not logged in Kite Engine is running, but you need to log in. Kite: Ready Kite is ready to go - start coding! Note: If you're running Kite for the first time, it may take several minutes for Kite to finish syncing and indexing your codebase. In the case of name and attribute completions, Kite will also provide the type of value represented by the completion e.g. module or function. 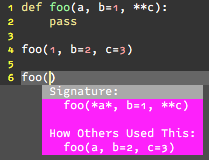 Continuing with the example code above, complete the function call to by typing the opening and closing parentheses. The top half of the UI shows the arguments that the function accepts. Arguments with default values will also have their default values shown. 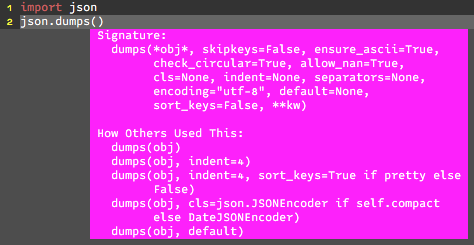 Note: You can also use <C-x> <C-u> while in insert mode to display the function signature information. 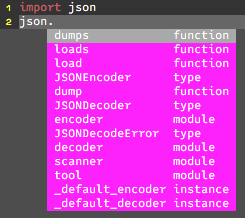 You may also run the KiteDocsAtCursor command to view the documentation.